Visibly brightens and freshens the skin. Encourages optimal exfoliation and skin renewal. Intensive antioxidant boosting elements help counteract pigmentation darkening. Enhances make-up and instantly reduces signs of fatigue. Water/Eau, Butylene Glycol, Alcohol Denat., Glycerin, Maris Aqua (Sea Water), Cirisum Eriophorum Callus Extract, Sodium Hyaluronate, Porphyridium Cruentum Extract, Acer Saccharum (Sugar Maple) Extract, Solanum Lycopersicum (Tomato) Leaf Cell Culture Extract, Polygonum Bistorta Root Extract, Saccharum Officinarum (Sugar Cane) Extract, Vaccinium Myrtillus Fruit Extract, Citrus Aurantium Dulcis (Orange) Fruit Extract, Citrus Limon (Lemon) Fruit Extract, Sodium Hydroxide, Xanthan Gum, Caprylyl Glycol, Carbomer, Disodium EDTA, Propanediol, Hexylene Glycol, Ethylhexylglycerin, PPG-26-Buteth-26, PEG-40 Hydrogenated Castor Oil, Chlorphenesin, Phenoxyethanol, Fragrance, Hexyl Cinnamal, Limonene, Linalool. AHA BOTANICAL BLEND: A concentrated combination of bilberry, sugar cane, orange, lemon and maple that is rich in natural occurring AHA, and particularly lactic, glycolic and citric acids. AURA-LIGHT CELLULAR CULTURE: Bio-engineered extract of Meadow Bistort that has a tremendous impact on the optical quality of the skin (inner reflection of light). Together with the bistort extract, a purified cell suspension from Wooly Thistle helps treat skin imperfections linked to hyper-seborrhea and hyper-pigmentation. OCEAN-MATRIX WATER: Comprised of sea water and a lyophilisate from a red algae (Porphyridium cruentum), this offers remarkable skin smoothing effects, reducing roughness while acting like a protective barrier. Due to a high level of natural fermented plant extracts, there might be slight variations in scent and product transparency. A characteristic under-scent some people might find peculiar, is simply the result of the fermented plant extracts included. While we could have decided to increase the fragrance level to better mask the ingredients, we decided not to do it, leaving the formula more natural. Apply every morning and evening after the Cell Shock White Facial Cleansing Foam, over towel-dried face. Pour a few drops into the palms of the hands and smooth over face and neck avoiding the eye area. 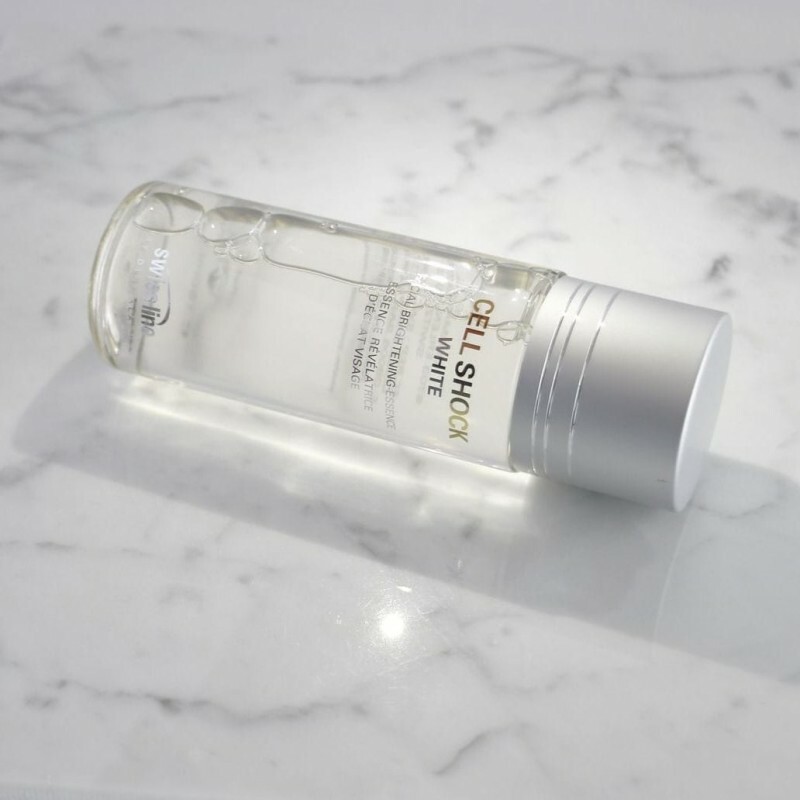 Allow to rest for a few seconds so the essence can sink-in and follow with an application of Cell Shock White Brightening Diamond Serum. Formulated for optimal daytime performance, this light- to medium-textured moisturizer offers an optical correction for a healthier complexion from the very first application. Antioxidants and anti-pollution factors join powerful complexes to brighten and safeguard skin all day long from urban stress and environmental assault. This product truly did work as a miracle on my skin. After trying the best of products to get rid of pigmentations on my skin I got this as a sample from the elmwood spa in toronto. I was a bit reluctant but thought of giving it a shot. And in a week the skin looked different already. It’s been over a year now and this is my only daily skin ritual. Can’t thank this product enough. Does this product have exfoliating action? Our Cell Shock White Facial Brightening-Essence contains natural occuring AHA coming from concentrated combination of bilberry, sugar cane, orange, lemon and maple, it also contains lactic, glycolic and citric acids.